Painting up Easter Eggs is always fun, but what happens when you use Matlab and equations that spit out spirographic art? Some really awesome eggs. Jiri Zemanek of the University of Prague did just that. Eggs were painted using EggBot (designed by Bruce Shapiro as open hardware and available as a kit from http://www.evilmadscientist.com/). To draw on eggs, we used standard permanent markers and an electro kistka with bee wax followed by dying. 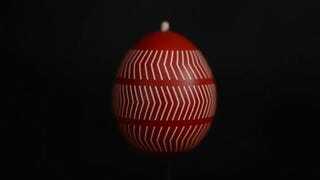 Eggs are rotated at a constant speed, special for each pattern, by a brushless motor. No computer graphics tricks are used in the video. The motion here is pretty wild, and they certainly blow away my own attempts at coloring eggs.